While Hubby learned about welding codes, I snagged a pool-side lounge chair and read several fiction and non-fiction books, jotted ideas for new projects, and took long walks on the beach, watching the dolphins play. In the evenings, Hubby joined me in the pool and we had a lovely dinner together, then watched the sunset. It was opportunity times three: increased work knowledge for him, creative renewal for me, and a refreshing time for us together. While we were there, we met someone else who understands what it means to grab an opportunity. This lovely creature is a Great Egret. Generally speaking, Egrets are wading birds. They wander along a river’s edge, marsh or lake shore, poised to catch fish. This Egret had expanded his menu options significantly. 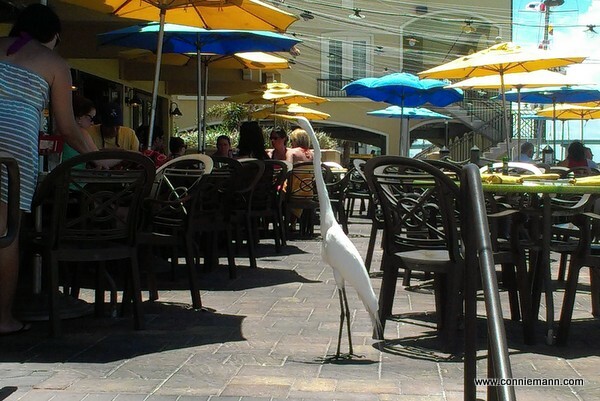 He strolled through the restaurant’s outdoor patio area, ready to help finish your meal if you turned your back. Even though this wasn’t his usual environment and maybe not his favorite food, he’d learned to make the most of the possibilities right in front of him. How about you? Are there opportunities you haven’t seen because you’re not looking? Have you ever tried something completely different—and been very glad you did? I’d love to hear about it in the comments below. Speaking of opportunities, I was thrilled to learn that Angel Falls was chosen as an “Inspiring Read for the Long Weekend” on iTunes. If you read on your Apple device, you can get a copy for only $3.99 through Monday. And if you know anyone who’d be interested, I’d be so grateful if you shared the link. Have a wonderful weekend, everyone! And Happy Birthday America–the Land of Opportunity!